Hollybeary Creations : Newton's Nook Feb Release Day 2!! Newton's Nook Feb Release Day 2!! Happy Tuesday everyone... It's Day 2 of the February Release from Newton's Nook Designs and today we are sharing the Fun new set Woodland Spring and it's coordinating die set. I paired the set with the new Bold Blooms stencil as my background. I created the background with the stencil and then I used the Land borders die set to trim it into a curve. I stamped and colored each of the images and then used the coordinating dies to cut them out. I created a banner sentiment from the Frames and Flags die set and then places the images around the banner using foam adhesive. Comment on the NND blog and Design Team blogs (see list below)! The winner will be chosen at random from the collective reveal posts. Make sure to check out each of their blogs and comment for your chance to win. You will not know which blog has been chosen so the more you comment on the better your chances are of winning! You have until Thursday, February 14th at 9pm EST to comment -- winners will be announced on the blog post on Friday, February 15th. That's a really cute design. Beautiful coloring, beautiful card. LOVE this set!! Love these sweet animals and your pretty background! Beautiful card! Your coloring is fabulous! These are so cute animals! Seeing your lovely card cheered me up! Love those darling new critters with flowers and your floral stenciled wave behind them is a terrific touch!! Such a pretty card! I love how you positioned the critters along the curvy stenciled panel. Love how you curved that background piece. Super eye catching and fun for this group of cute critters. Cute coloring and I like the background design. Such a cute card! 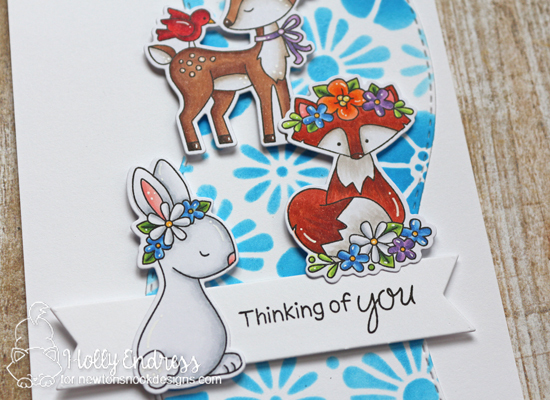 Love those adorable animals & the blue flowers in the background of your card! Gorgeous card! I love your coloring and great use of the stencil! Everybody is in their Easter bonnets. What a sweet sweet card. The blue background is stunning against those adorable animals. Love how you used the stencil for that background panel in blue - really sets off the lovely coloring on the stamps. Very nice! Love the cool tones by using blue ink on the stencil background. Sweet card! I love the way you stencils that background element, which makes everything pop. Beautiful card! What a cute card! Love the background. I LOVE that shaped stenciled background! Great coloring too! I love your card! It is truly lovely! wow, what a really cool card design idea! Love what you did with the new Woodland spring stamp set!